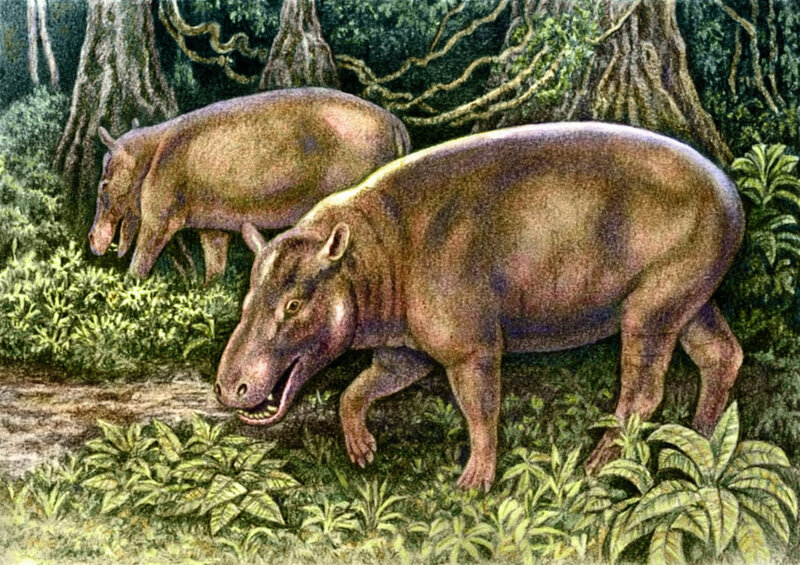 Reconstruction of Brachyodus aequatorialis, copyright WillemSvdMerwe. The Ruminantiamorpha are a clade of artiodactyls including all species closer to modern ruminants than to other living artiodactyls. Living ruminants are characterised by the possession of a multi-chambered stomach in which food is broken down by bacteria living in a large fermentation chamber, the rumen. See also: Horns and guts. Synapomorphies (from Janis & Scott 1988): Tarsus with fused cuboid and navicular; upper incisors reduced or lost; incisiform lower canines. [B78] Black, C. C. 1978. Anthracotheriidae. In: Maglio, V. J., & H. B. S. Cooke (eds) Evolution of African Mammals pp. 423–434. Harvard University Press: Cambridge (Massachusetts). [D59] Darwin, C. 1859. The Origin of Species by Means of Natural Selection, or the preservation of favoured races in the struggle for life 1st ed. John Murray: London. [S68] Simons, E. L. 1968. African Oligocene mammals: introduction, history of study, and faunal succession. Peabody Museum of Natural History, Yale University, Bulletin 28: 1–21. [TC07] Thewissen, J. G. M., L. N. Cooper, M. T. Clementz, S. Bajpai & B. N. Tiwari. 2007. Whales originated from aquatic artiodactyls in the Eocene epoch of India. Nature 450: 1190–1194. [TD89] Thomas, O., & G. Doria. 1889. Diagnosi di una nuova specie del genere Cervulus raccolta da L. Fea nel Tenasserim. Annali del Museo Civico di Storia Naturale di Genova, Serie 2a, 7: 92.